A powerful influence on the heart and mind of a young girl discovering her soul. He was like a god to me, creatively skillful and capable beyond my wildest dreams. Yet unreachable, beyond my immature passion and undeveloped skills. I kept him in my heart, longing to grow closer, to learn his secrets. Eventually I grew disappointed with my own immature efforts and let him slip away. Like a discouraged lover on the rebound I found other distractions, sealing him into a lost cavern in my heart. I have been waiting my whole life for this moment. Tears run down my cheeks as the secret cavern is reopened. I have to stop, sit down and take a breath, being unsure if I can take it all in at once. 180 original prints, drawings and models by M.C. 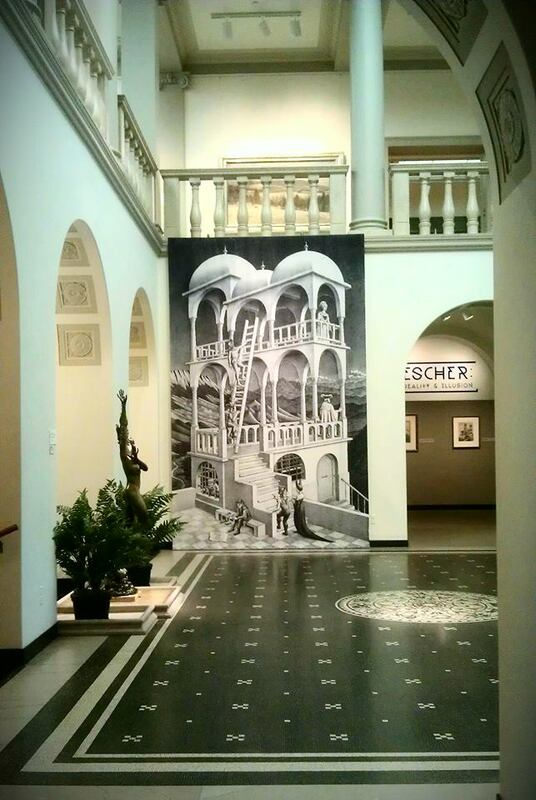 Escher taking up 4 galleries at the Currier Museum of Art in Manchester, NH. I love Escher, his work, his mind, his heart and skill. With magnifying glass in hand I study every detail, imagine the process, and once again feel awestruck. The early works of the 1920’s and ’30’s are what captured my interest most because many of these I had not seen before. Also to read about the process of artistic growth he went through from his beginning at the School of Architecture and Decorative Arts in the Netherlands, through his travels and early commissions. What I admire most is that he perfected his draftsmanship and printing craftsmanship to the point of oneness with this laborious medium. It is one thing to look at this work reproduced in a book, and an altogether different experience to see original lithographs, wood carvings, wood engravings, mezzotints, and pen & ink and pencil drawings and final drawings on transfer paper. Some of the original plates and stones were also on display as well as a few models. There was even an illustration by the artist that explained the printmaking process. Most people are familiar with his later work from the 1940’s to the 60’s, tessellations and impossible worlds. I love these works too and it was exciting to see them in their full form and glory as well. What I enjoyed most about the exhibit though were the descriptions of his process of discovery, his relationships with people and the environment, his humor, and the spiritual qualities he was striving to express. I spent 4 hours at this show on Saturday and every minute was worth it. I would have driven 100 miles to see this show, but I am so fortunate that it came to where I live. 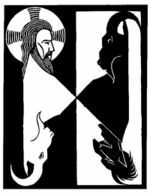 If you live anywhere in the general Boston/northern New England area and have an interest in the work of M.C.Escher it would be worth the drive. Great, thanks for stopping by. Your description is intriguing – I had never heard of him before. Glad you opened the door again! Oh, you should really Google M.C. 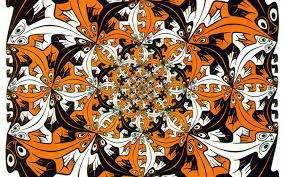 Escher, his work is fascinating.